Below you’ll find a simple programme to easily calculate Current and Votlage Power Spectral Densities (PSD) of electrochemical noise data. If you have any questions or problems, contact Francois Huet for assistance! PLEASE NOTE: The programme is the property of Francois Huet. You are allowed to use the programme for non-commercial purposes only! 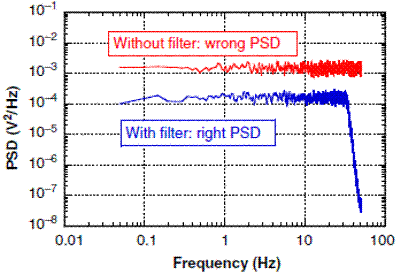 The programme calculates the potential PSD, the current PSD, and the noise impedance Zn (square root of the ratio PSD V/PSD I) of an electrochemical noise data file consisting of three columns (time in s, potential noise in V, and current noise in A) separated by tabulators. The programme can also divide the time record in one or several sections over which it averages the PSDs (to get less “noisy” PSDs). For configuration of the PSD calculator programme you need the file below. This configuration file has to be modified according to your data. This file and the PSD calculation programme must be in the same directory where the electrochemical noise data file is. Here you find a text-file with insructions on how to use the PSD calculation programme and configuration file.